RD PowerPro™ offers a power tool for computing the dietary food exchanges that meet the client’s exact needs by means of the SOLVER algorithm. SOLVER allows for an instantaneous calculation of a complete diet plan that meets the client’s exact calorie, carbohydrate, protein, and fat goals. The use and integration of the SOLVER algorithm into the RD PowerPro™ Software allows the Registered Dietitian to spend more time working with clients and less time crunching numbers. When using the SOLVER feature, the Registered Dietitian has complete control to set goals for total caloric needs (factor above or below the calculated TDEE) and the macronutrient distribution of the diet (percentage of calories from carbohydrates, proteins, and fats). The Registered Dietitian may fine-tune the diet for their client by setting minimum and maximum servings limits for each food category. 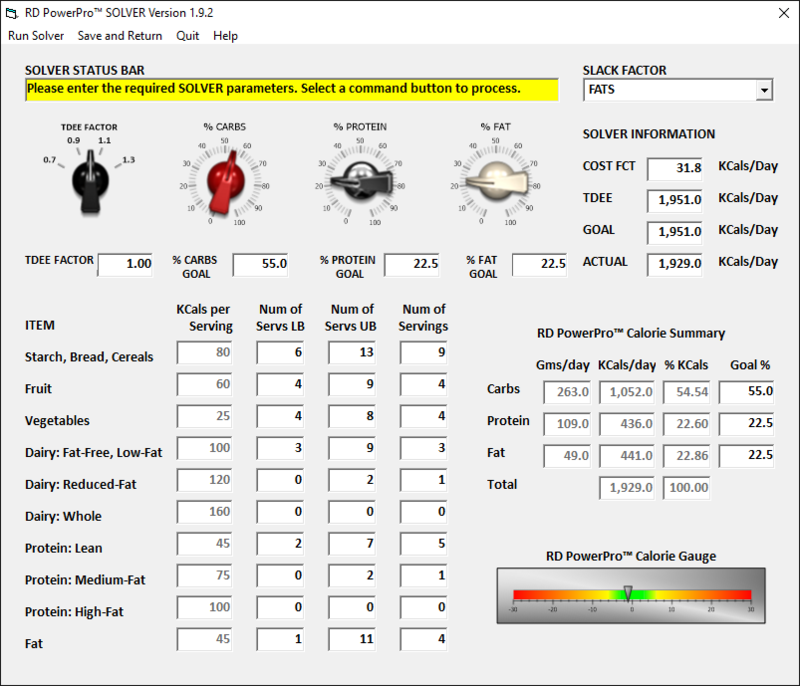 When these parameters are set, the Registered Dietitian simply selects RUN SOLVER and the SOLVER feature quickly computes the number of servings for each food item. The Registered Dietitian has complete control on the diet plan developed with the ability to set minimum and maximum serving limits for each food category. If the Registered Dietitian does not want SOLVER to include servings from a particular food category (i.e. high fat meats), the minimum and maximum servings can be set at zero. The Registered Dietitian may adjust the inputs to SOLVER by adjusting the TDEE factor, percentage goals, and min/max limits on the food items and then selecting RUN SOLVER on the main menu to obtain a new solution. Running SOLVER with the exact same INPUTS may and will result in different results due to the adaptive SOLVER algorithm. When finished, the Registered Dietitian may save the results from the very last SOLVER run and/or the results obtained may be discarded.